After playing baseball in high school at Cherry Hill High School East and at Bowling Green State University, Hershiser was drafted by the Los Angeles Dodgers in 1979. After several years in the minor leagues, he made his major league debut with the Dodgers in 1983. During his tenure with the team, Hershiser was a three-time All-Star. Hershiser's most successful season came in 1988, when he set a major league record by pitching 59 consecutive innings without allowing a run. He helped lead the Dodgers to a championship in the 1988 World Series, and was named the National League (NL) Championship Series Most Valuable Player (MVP) and the World Series MVP. That season, he won the NL Cy Young Award and an NL Gold Glove Award. He later pitched in two more World Series and earned the American League Championship Series MVP Award. After 12 seasons with the Dodgers, Hershisher spent time with the Cleveland Indians, San Francisco Giants, and New York Mets before returning to Los Angeles for his final season. After retirement as a player, he briefly worked as a coach and team executive for the Texas Rangers before serving as a color analyst for ESPN and then the Dodgers. Known for his slight frame and fierce competitive spirit, Hershiser was nicknamed "Bulldog" by former Dodgers manager Tommy Lasorda, who managed Hershiser during his time with the Dodgers. Hershiser was born in Buffalo, New York, to Orel Leonard Hershiser III and his wife Mildred. The family moved to Detroit, Michigan, when he was six and to Toronto, Canada, when he was 12. At age eight, Hershiser was the third-place finisher in a national hit, run, and throw competition. Hershiser played in Little League Baseball until he was 12. His father was a coach and league administrator and his mother ran the snackbar. During his family's time in Canada, he participated in ice hockey with the Don Mills Flyers in the Greater Toronto Hockey League. His family moved again and he attended Cherry Hill High School East in Cherry Hill, New Jersey. He did not make the varsity team until his junior year as he spent his first year on the freshman team and his second year on the junior varsity. He set the single-game strikeout record for his high school in 1976 when he retired 15 batsmen in a game against Deptford, a record that stood for 21 years. He also remains on the school's leader-boards in career winning percentage, strikeouts and earned run average (ERA). He was an all-conference selection his senior year. Hershiser received only a partial scholarship from Bowling Green State University. He barely played his freshman year and was academically ineligible as sophomore. He left school and hitchhiked home, where his parents convinced him to return to school. He enrolled in summer school to bring his grades up and worked at his father's paper company during the summer. He grew and gained 15 pounds (6.8 kg) during that summer which added 5 miles per hour (8.0 km/h) to his fastball and led to him getting more playing time. He made the all-Mid-American Conference All-Star team his junior year, during which he pitched a no-hitter against Kent State on May 4, 1979. He won that game 2-0 despite only striking out two batters. In his only full-time season with the baseball team, in 1979, he was 6-2 with a 2.26 ERA. He was also a member of the Sigma Phi Epsilon fraternity. One of his fraternity brothers played a joke on him on draft day, pretending to be a scout from the San Diego Padres calling to tell him he was drafted in the first round. After getting excited and starting to call his friends he realized it was a hoax. Hershiser was selected by the Los Angeles Dodgers in the 17th round of the 1979 Major League Baseball draft. The original scouting report on him for the draft said that he had poor control, a weak fastball and threw the curveball incorrectly. It went on to state that he rattled easily and had questionable makeup. The Dodgers assigned him to their Class A farm team in the Midwest League, the Clinton Dodgers. He started four games for Clinton in 1979, and appeared in 11 more out of the bullpen to finish with a 4–0 record with a 2.09 ERA. Hershiser spent the next two seasons in AA with the San Antonio Dodgers of the Texas League. He worked primarily as a reliever at San Antonio. He was leading the league in saves at one point but then gave up 20 runs in seven innings on a road trip. He called this point the lowest of his career. He wanted to quit but the manager and pitching coach talked him out of it. Hershiser was promoted to the Triple-A Albuquerque Dukes of the Pacific Coast League in 1982. He was 9–6 with a 3.71 ERA in 47 games, with seven starts. He was almost included in a trade with the Texas Rangers that season, but catcher Jim Sundberg wanted his contract re-written before agreeing to the deal and the Dodgers backed out of the transaction. Hershiser won the Mulvey Award as the Dodgers top rookie in spring training in 1983 and expected to make the club but was sent back to Albuquerque where he was briefly reunited with pitching coach Rocky Giordani. He was 10–8 with a 4.09 ERA for the Dukes in 1983 in 49 games, with 10 starts and 16 saves. Hershiser was called up to the Dodgers for the first time on September 1, 1983, and made his debut the same day, against the Montreal Expos. He came into the game in the seventh inning and retired all three batters he faced on two ground outs and a strikeout (of Tim Wallach). However, in his second inning of work he allowed a double and a single for a run and was promptly taken out of the game. In eight appearances that month, he had an ERA of 3.38. Hershisher played winter ball in the Dominican Republic after the season and worked with pitching coach Dave Wallace on his delivery. He was almost arrested when some fireworks his friends were setting off for a New Year's party hit a Dominican General's house, but Dodger coach Manny Mota intervened on his behalf. Hershiser made the Dodgers Opening Day roster for the 1984 season as the last man in the bullpen and was mostly used as a long reliever early on. His first win was in a 12-inning game against the St. Louis Cardinals on April 5. After getting pounded in one game, Dodger manager Tommy Lasorda gave him such a verbal lashing that was so loud teammates took to calling it "sermon on the mound". Lasorda told Hershiser that he was too timid on the mound, giving hitters too much respect. He gave him the nickname "Bulldog" so that he would have a tougher attitude in games. Hershisher made his first start on May 26 against the New York Mets because of an injury to Jerry Reuss. He pitched six innings and allowed only one run. He became a full-fledged starter in the Dodger rotation in July and responded by pitching four complete game shutouts that month, which was good enough to tie for the most in the Majors that season (with Joaquín Andújar and teammate Alejandro Peña). He finished the season with a record of 11–8 and a 2.66 ERA in 45 games (20 starts). In the 1985 season he led the National League (NL) in winning percentage, compiling a 19–3 record with a 2.03 ERA. The Dodgers won the NL West, and Hershiser finished third in Cy Young Award voting. He also saw his first post-season action, pitching in two games in the 1985 National League Championship Series. In the 1986 season, Hershiser went 14–14 with a 3.85 ERA. The next season he was selected to his first All-Star Game while compiling a 16–16 record with a 3.06 ERA. Hershiser in 1988 led the league in wins (23), innings (267), shutouts (8) and complete games (15). He was third in ERA at 2.26. He finished the season with a record 59 consecutive scoreless innings pitched, breaking the mark of 58 held by former Dodger Don Drysdale. The streak began on August 30, when he pitched four scoreless innings to conclude a game and the record was broken when he pitched 10 shutout innings, on 116 pitches, in the final game of the season. He was selected to his second all-star game and was a unanimous selection for the National League Cy Young Award. He also won the Gold Glove Award for the best fielding pitcher in the National League. In the 1988 National League Championship Series between Hershiser's Dodgers and the New York Mets, Hershiser not only started Games 1 and 3, but recorded the final out in Game 4 in relief for a save. He then pitched a shutout in Game 7 and was selected as the NLCS MVP. He then pitched a shutout in Game 2 of the World Series and allowed only two runs in a complete game in the clinching victory in Game 5, winning the World Series MVP Award. Hershiser is the only player to receive the Cy Young Award, the Championship Series MVP Award, and the World Series MVP Award in the same season. He later received both The Sporting News Pitcher of the Year and Sports Illustrated magazine's Sportsman of the Year award for his accomplishments in 1988. Hershiser signed a new $7.9 million three-year contract with the Dodgers prior to the 1989 season that was the richest three-year contract ever signed to that point. That season, he made his third straight All-Star team and he had another good year with an ERA of 2.31 in 35 games. However, the Dodgers weren't as good and he suffered from a lack of offensive support. He went 0–7 over one nine game stretch because the team only scored nine runs total in that period. He had a 15–15 record that season but only evened it out because he pitched 11 innings in the last game of the season and threw 169 pitches. He was determined to stay in until his team took the lead, no matter what the manager wanted. After just four starts in 1990, it was discovered that Hershiser had a torn labrum in the shoulder of his pitching arm. Dr. Frank Jobe performed shoulder reconstruction surgery on Hershiser on April 27, 1990, the first time the procedure had been performed on a major league player. He did not rejoin the Dodgers until May 29, 1991, a return that he called "a miracle." Two games later, he picked up his 100th career win against the Chicago Cubs on June 9, 1991. In 21 starts, he was 7–2 with a 3.46 ERA. He won his last six decisions and was selected as the UPI Comeback Player of the Year. There were still questions about his recovery heading into 1992, but he managed to pitch 33 games in both 1992 and 1993. His numbers were not what they were before the surgery, but he was still effective. He was 10–15 with a 3.67 ERA in 1992 and 12–14 with a 3.59 ERA in 1993. Notably in 1993, Hershiser hit .356 in 83 plate appearances, earning a Silver Slugger Award. In his final start of 1994, on August 7, Hershiser took a no-hit bid into the sixth inning before it was broken up. The 1994–95 Major League Baseball strike ended the season on August 11. Hershiser was involved in the negotiations as part of the Major League Baseball Players Association but the strike signaled the end of his time with the Dodgers and he became a free agent. Hershiser signed a three-year contract with the Cleveland Indians on April 8, 1995. Indians General Manager John Hart said that the team was looking for a veteran with "character and competitiveness" to show the young players how to play the right way. He went 16–6 with a 3.87 ERA in 26 starts for the Indians in 1995 to lead the young team to their first post-season appearance in 41 years. Hershiser won the two games he pitched in the 1995 American League Championship Series (ALCS) against the Seattle Mariners and was selected as the ALCS MVP, the first player to have won the LCS MVP Award in both leagues. He also pitched effectively in the 1995 World Series against the Atlanta Braves, though the Indians would lose the series in six games. He pitched two more seasons for the Indians, and was 14–6 for the 1997 team, including pitching seven shutout innings in Game 3 of the 1997 ALCS. In his final World Series appearance in 1997 he gave up 13 runs in 10 innings and lost 2 games to the Florida Marlins. Though he pitched for the Indians for only three seasons, Hershiser became something of a folk hero in Cleveland. One memorable image from his tenure is of Hershiser screaming "Take that!" at the Braves dugout after starting a 1–3 double play late in game five of the 1995 World Series. Hershiser signed a one-year $3.45 million contract with the San Francisco Giants on December 7, 1997. He made 34 starts and was 11–10 with a 4.41 ERA in 1998. The contract contained an option for 1999 but the Giants declined the option after the season. At the time they said they might come to terms on a new deal. Instead he signed a minor league contract with the Indians on February 20, 1999. The Indians released him during spring training and he signed with the New York Mets on March 25, 1999. Hershiser made 32 starts with the Mets and was 13–12 with a 4.58 ERA. He served as a mentor to the young pitchers on the Mets staff and helped them make the playoffs by allowing just one run in 5 1/3 innings in a 2–1 win over the Pittsburgh Pirates in the last game of the season. He pitched out of the bullpen in the playoffs as the Mets lost to the Braves in the 1999 National League Championship Series. Hershiser signed a one-year contract to return to the Dodgers on December 17, 1999. He started the home opener on April 14, 2000 against the Reds and allowed only one run in six strong innings. He struggled after that, allowed 36 runs on 42 hits, 14 walks and 11 hit batters. His 13.14 ERA in 2000 is the worst ERA by any pitcher with 20 or more innings. One day after allowing eight runs in 1 2/3 innings on June 26, he was released by the Dodgers. I have a sinking fastball to either side of the plate, a cutter (which changes the direction of my fastball so it breaks instead of sinking), to either side of the plate, a curveball I throw at three speeds and three angles, a straight change—using the same arm speed and position as a fastball but with a grip and a release that slows it dramatically, and changeups to different locations that I throw off my sinker which look like batting practice fastballs. Different locations, different speeds, and slightly different arm angles on all those pitches give me a wide palette of choices. By 1999, he noted that his pitches were not as sharp, so he added a slider to the mix. He also emphasized locating his pitches in good spots: "You'll hear pitchers say, 'I had great stuff and got shelled,' but you never hear them say, 'I had great location and got shelled.'" Hershiser remained with the Dodgers briefly as a player-personnel consultant. He went to AAA Albuquerque and filed one report but there wasn't much for him to do so he left the position. He was subsequently hired to work on broadcasts of the Little League World Series for ABC and ESPN in 2000–2001. He also worked on Wednesday Night Baseball for ESPN during the 2001 season. Hershiser left that position to join the Texas Rangers as a special assistant to General Manager John Hart in fall of 2001 and was named as the Rangers pitching coach on June 22, 2002. In October 2005 Hershiser was mentioned as a candidate to replace Jim Tracy as manager of the Dodgers, but the position went to Grady Little. He was also mentioned as a possible replacement for Ken Macha of the Oakland Athletics; however, he was ultimately passed over for Bob Geren. He left his position of Rangers pitching coach after the 2005 season to become an Executive Director of the Rangers, reporting to Club President Jeff Cogen. He didn't last long in that position as he quit on February 3, 2006. On February 13, 2006, Hershiser rejoined ESPN as an analyst for Baseball Tonight, Sunday Night Baseball, and the Little League World Series. Through a group which included fellow former Dodger Steve Garvey, Hershiser became involved in the bidding process for the Dodgers when the team was up for sale in 2011–2012. His group did not make it past the first round of the bidding. He chose to leave ESPN and re-join the Dodgers as a television analyst for their new regional sports network SportsNet LA in 2014. Hershiser teams with Charley Steiner and Nomar Garciaparra to call Dodger road games not played in San Francisco when Vin Scully does not travel. Hershiser started playing poker competitively in 2006. After retirement from baseball he moved to Summerlin, Nevada and befriended a poker instructor. He became a regular at Red Rock's poker room in Summerlin, playing $2–$5 NLHE. Hershiser signed with Poker Royalty to represent his poker career. He was invited to participate in the 2008 NBC National Heads-Up Poker Championship. Playing under the PokerStars banner, Hershiser stunned the poker world by making the quarterfinals, defeating 2006 event champion Ted Forrest, Allen Cunningham, and Freddy Deeb—players who had won a total of 12 World Series of Poker bracelets heading into the event. Andy Bloch defeated him in the quarterfinals. Hershiser has played in a number of events, including the 2008 World Series of Poker and the 2009 PokerStars Caribbean Adventure. Hershiser won $54,570 on September 7, 2008 by taking ninth place in the $10,000 Pokerstars World Championship of Online Poker Event 5. 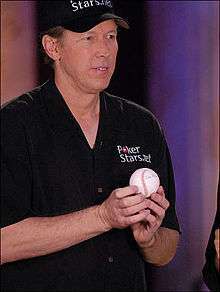 Hershiser also has made a tradition of giving an autographed baseball to the poker player who eliminates him. Hershiser and his first wife, Jamie Byars, divorced in 2005. They have two sons, Orel Leonard V (known as Quinton) and Jordan. Hershiser married his second wife, Dana Deaver, a former literacy specialist, in December 2010. Jordan graduated from St. Mark's School of Texas in 2007, where he earned all-conference honors in baseball and basketball, and played college baseball at the University of Southern California as a pitcher and first baseman. Despite his college career being hampered by injuries, Jordan was drafted by the Dodgers in the 34th round of the 2012 MLB draft. Hershiser and Deaver currently reside in Las Vegas with Deaver's children, son Spencer and daughter Sloane. Hershiser is an active Christian. He was a guest star on an episode of the Christian children's video series The Adventures of McGee and Me in 1992 entitled Take Me Out of the Ball Game. On an appearance on The Tonight Show after the 1988 World Series, Johnny Carson talked him into singing hymns for the audience. Orel Hershiser and Jerry B. Jenkins (1989). Out of the Blue. Wolgemuth & Hyatt. ISBN 0-943497-57-4. Orel Hershiser (2002). Between the Lines: Nine Things Baseball Taught Me About Life. Warner Faith. ISBN 0-446-67907-0. 1 2 3 4 Newman, Bruce (May 5, 1986). "A Big-name Pitcher". Sports Illustrated. Retrieved August 25, 2013. ↑ Schlossberg, Dan (June 2003). "Flashback: Orel Hershiser's 1988 Season". Baseball Digest. 62 (6). p. 48. ↑ Cafardo, Ben (May 5, 1986). "ESPN analyst Orel Hershiser and his family have rich Little League Baseball history". ESPN. Retrieved August 25, 2013. 1 2 3 4 5 6 7 Wulf, Steve (December 19, 1988). "Deep Roots". Sports Illustrated. Retrieved August 25, 2013. ↑ Cronin, Brian (November 28, 2012). "Was Orel Hershiser cut by his high school baseball team?". LA Times. Retrieved August 25, 2013. ↑ Cherry Hill Patch Staff (June 14, 2012). "Hershiser Named Speaker for 2013 College World Series". Cherry Hill Patch. Retrieved August 25, 2013. ↑ "Encyclopedia of New Jersey". Google Books. Retrieved August 25, 2013. ↑ "Orel Hershiser". Bowling Green Athletics. Retrieved August 25, 2013. ↑ "2013 Bowling Green University Falcons Baseball Media Guide" (PDF). Bowling Green Athletics. February 12, 2013. Retrieved October 23, 2013. ↑ "1979 BG Statistical Leaders" (PDF). Bowling Green State University Falcons Website. Retrieved October 23, 2013. ↑ Hershiser, Orel and Robert Wolgemuth. "Between the Lines: Nine Principles to Live By". OfSpirit.com. Retrieved August 26, 2013. ↑ Schwarz, Alan (June 2, 2004). "What scouts said ...". ESPN.com. Retrieved August 26, 2013. ↑ "1979 Clinton Dodgers Statistics". Baseball Reference.com. Retrieved August 26, 2013. ↑ "1982 Albuquerque Dukes Statistics". Baseball Reference.com. Retrieved August 26, 2013. ↑ "1983 Albuquerque Dukes Statistics". Baseball Reference.com. Retrieved August 26, 2013. ↑ "September 1, 1983 Los Angeles Dodgers at Montreal Expos play-by-play and box score". Baseball Reference.com. Retrieved August 26, 2013. 1 2 3 4 5 6 7 8 9 10 11 12 13 14 15 16 "Orel Hershiser statistics & history". Baseball Reference.com. Retrieved August 26, 2013. ↑ "April 5, 1984 St. Louis Cardinals at Los Angeles Dodgers play-by-play and box score". Baseball Reference.com. Retrieved August 26, 2013. ↑ Lasorda, Tommy (April 15, 2011). "Blogging about the Bulldog". MLB Pro Blog. Retrieved August 26, 2013. ↑ "Orel Hershiser 1984 pitching gamelogs". Baseball Reference.com. Retrieved August 26, 2013. ↑ "September 28, 1988 Los Angeles Dodgers at San Diego Padres play-by-play and box score". Baseball Reference.com. Retrieved August 26, 2013. ↑ "Orel Hershiser still the gem you remember". ESPNLA.com. April 2, 2011. Retrieved August 26, 2013. ↑ Simon, Mark (August 30, 2013). "Inside Hershiser's scoreless streak". ESPNLA.com. Retrieved September 1, 2013. ↑ Holtzman, Jerome (November 11, 1988). "Hershiser Easy Cy Young Pick". Chicago Tribune. Retrieved August 26, 2013. ↑ "1988 League Championship Series (4–3): Los Angeles Dodgers (94–67) over New York Mets (100–60)". Baseball Reference.com. Retrieved August 26, 2013. ↑ "1988 World Series (4–1): Los Angeles Dodgers (94–67) over Oakland Athletics (104–58)". Baseball Reference.com. Retrieved August 26, 2013. ↑ Mitchell, Houston (May 2, 2013). "The 20 greatest Dodgers of all time, No. 12: Orel Hershiser". LA Times. Retrieved August 26, 2013. ↑ Chass, Murray (February 17, 1989). "Another Record for Hershiser: $7.9 Million Dodger Contract". New York Times. Retrieved August 26, 2013. 1 2 Stephen, Eric (January 16, 2010). "The Bulldog Belongs: A Look Back At Orel Hershiser". truebluela.com. Retrieved August 26, 2013. ↑ "October 1, 1989 Los Angeles Dodgers at Atlanta Braves play by play and box score". baseballreference.com. Retrieved August 26, 2013. ↑ Kurkjian, Tim (July 28, 2009). "Baseball's magic number: 100". ESPN.com. Retrieved August 26, 2013. ↑ Associated Press (April 28, 1990). "SPORTS PEOPLE: BASEBALL; Shoulder Injury Ends Hershiser's Season". New York Times. Retrieved August 26, 2013. ↑ "Hershiser Comeback A 'Miracle'". Sun Sentinel. May 30, 1991. Retrieved August 26, 2013. ↑ Plaschke, Bill (June 10, 1991). "Hershiser A Real Hit In Comeback". Seattle Times. Retrieved August 26, 2013. ↑ "HERSHISER NAMED NL COMEBACK PLAYER". Deseret News. November 12, 1991. Retrieved August 26, 2013. ↑ Dolch, Craig (March 15, 1992). "Hershiser still must prove to skeptics that he's back from shoulder surgery". Baltimore Sun. Retrieved August 26, 2013. ↑ Associated Press (August 8, 1994). "BASEBALL; Hill's 16th 'Clinches' N.L. East For Expos". New York Times. Retrieved August 26, 2013. ↑ Associated Press (August 10, 2004). "1994 strike was a low point for baseball". ESPN.com. Retrieved August 26, 2013. ↑ Bodley, Hal (September 12, 2004). "Baseball still learning lessons from '94 strike". USA Today. Retrieved August 26, 2013. 1 2 3 Richards, Ryan (May 21, 2012). "Top 100 Indians: #95 Orel Hershiser". letsgotribe.com. Retrieved August 26, 2013. ↑ Newhan, Ross (June 21, 1995). "Rearmed and Dangerous : Indians Put Orel Hershiser on Their Most-Wanted List and He Hasn't Let Them Down". LA Times. Retrieved August 26, 2013. ↑ "1995 League Championship Series (4–2): Cleveland Indians (100–44) over Seattle Mariners (79–66)". Baseball Reference.com. Retrieved August 26, 2013. ↑ "1995 World Series (4–2): Atlanta Braves (90–54) over Cleveland Indians (100–44)". Baseball Reference.com. Retrieved August 26, 2013. ↑ Newhan, Ross (April 21, 1996). "Examining Orel : The Old Bulldog Had a Rebirth in Postseason for Indians, and at 37, Hershiser Has No Plans for a Farewell Tour". LA Times. Retrieved August 26, 2013. ↑ "1997 League Championship Series (4–2): Cleveland Indians (86–75) over Baltimore Orioles (98–64)". Baseball Reference.com. Retrieved August 26, 2013. ↑ "1997 World Series (4–3): Florida Marlins (92–70) over Cleveland Indians (86–75)". Baseball Reference.com. Retrieved August 26, 2013. ↑ Eby, Steve (July 28, 2012). "Orel Hershiser: His Greatness Was Defined After His Greatest Years". didthetribewinlastnight.com. Retrieved August 26, 2013. ↑ "BASEBALL: NOTEBOOK – SAN FRANCISCO; Giants Send Hershiser Packing". New York Times. October 22, 1998. Retrieved August 26, 2013. ↑ Inquirer Wire Services (February 21, 1999). "Hershiser Returning To Indians". Philadelphia Inquirer. Retrieved August 26, 2013. ↑ "Orel Hershiser 1999 Pitching Gamelogs". Baseball Reference.com. Retrieved October 17, 2013. ↑ Sullivan, Stephen (October 23, 2010). "Orel Hershiser – His Mets Career 1999". New York Mets History online. Retrieved August 26, 2013. ↑ "NATIONAL LEAGUE: YESTERDAY; Vintage Hershiser Wins In 2nd Stint as a Dodger". New York Times. April 15, 2000. Retrieved August 26, 2013. ↑ "Dodgers waive Orel Hershiser; veteran RHP will mull options". ESPN Baseball. June 27, 2000. Retrieved August 26, 2013. ↑ Keown, Tim (June 5, 1998). "Mind Over Batter; Hershiser's brain a key to his success with Giants". San Francisco Chronicle. SFGate.com. Retrieved May 25, 2012. ↑ James, Bill; Neyer, Rob (June 15, 2004). The Neyer/James Guide to Pitchers: An Historical Compendium of Pitching, Pitchers, and Pitches. Simon & Schuster. pp. 241–242. ISBN 978-0-7432-6158-6. Retrieved May 25, 2012. ↑ Anderson, Dave (July 4, 1999). "Hershiser's Best Pitch Is His Brainball". The New York Times. Retrieved May 26, 2012. ↑ Stewart, Larry (August 10, 2001). "Hershiser Flawless in New Field". La Times. Retrieved August 26, 2013. ↑ Associated Press (August 26, 2000). "Hershiser makes broadcast debut". ESPN. Retrieved August 26, 2013. ↑ "Orel Hershiser bio". Prime Speakers Bureau. Retrieved August 26, 2013. ↑ "Orel Hershiser Rangers pitching coach". UPI.com. June 22, 2002. Retrieved August 26, 2013. ↑ Associated Press (November 18, 2002). "Orel Hershiser moves into Rangers front office". Smoaky.com. Retrieved August 26, 2013. ↑ Urban, Mychael (October 26, 2006). "Hershiser, Quirk up for managerial job". MLB.com. Retrieved August 17, 2012. ↑ Rangers Press Release (November 18, 2005). "Rangers pitching coach Orel Hershiser resigns, joins front office". MLB.com. Retrieved August 26, 2013. ↑ Associated Press (February 3, 2006). "Orel Hershiser Leaving Texas Rangers". AP News Archive. Retrieved August 26, 2013. ↑ "Orel Hershiser ESPN bio". ESPN. Retrieved August 26, 2013. ↑ "Steve Garvey, Orel Hershiser form group". ESPN. June 6, 2011. Retrieved August 26, 2013. ↑ Jackson, Tony (January 28, 2012). "Source: Dodgers begin narrowing bids". ESPNLosAngeles.com. ESPN.Go.com. Retrieved August 17, 2012. ↑ Dilbeck, Steve (December 8, 2013). "Dodgers hire Orel Hershiser as new team broadcaster". Retrieved December 8, 2013. ↑ Morrill, Julia (August 2, 2010). "Romance brought the Dodgers great to Las Vegas and a card game may keep him there". Sports Illustrated. Retrieved August 27, 2013. ↑ "Professional Poker Player Orel Hershiser". Porker Royalty. Retrieved September 12, 2013. ↑ Wise, Gary (March 2, 2008). "Two days and a busted bracket". ESPN.Go.com. Retrieved March 4, 2008. ↑ Wise, Gary (March 4, 2008). "A great event and a deserving champion". ESPN.Go.com. Retrieved March 4, 2008. ↑ "Dorinvandy Wins; Chris "Money800" Moneymaker, Orel Hershiser Make Deep Run in WCOOP #5". September 8, 2008. Retrieved August 26, 2013. ↑ Calistri, Amy (March 2, 2008). "2008 NBC National Heads-Up Poker Championship: Ferguson and Bloch Make Finals". Poker News. Retrieved August 27, 2013. 1 2 Stewart, Larry (June 9, 2006). "Hershiser's Evolution Proves Interesting". LA Times. Retrieved August 27, 2013. ↑ Clarke, Norm (January 2, 2011). "Hershiser Hitched". LasVegas Review-Journal.com. Retrieved April 1, 2014. ↑ "Jordan Hershiser USC Profile". USC Trojans. Retrieved August 27, 2013. ↑ Angert, Alex (June 6, 2012). "Hershiser's son drafted by Dodgers". mlb.com. Retrieved August 27, 2013. ↑ 2014 Los Angeles Dodgers Media Guide. Los Angeles Dodgers, Inc.
↑ "Orel Hershiser". Brooks International. Retrieved August 17, 2012. ↑ Deninno, Nadine (January 13, 2012). "Tebowing: Tim Tebow Did Not Create Pose, Orel Hershiser Did". Sports & Stars. IBTimes.com. Retrieved August 17, 2012. ↑ Mendoza, N.F. (September 6, 1992). "Learning lessons about life through baseball on ABC's 'McGee and Me!'". LA Times. Retrieved August 27, 2013. ↑ Edes, Gordon (April 9, 1989). "Orel : The Dodgers' Wholesome Right-Hander Plots His Financial Future and Wonders If He Can Live Up to Last Season's Success". LA Times. Retrieved August 27, 2013.